The Cream Experience have been confirmed for this year’s UK Guitar Show. The event will take place at London’s Olympia on September 29 & 30 and is brought to you by the organisers of the London Drum Show and the London Bass Guitar Show and is run in association with MusicRadar, Guitarist, Total Guitar, Guitar Techniques and Louder. Last month, details of the acoustic workshops and tuition clinics were announced, revealing that YouTube sensation Justin Sandercoe will be there, while Guitar Techniques magazine’s long standing classical tutor Bridget Mermikides, along with Jon Bishop and Steve Allsworth will also be in attendance. Periphery guitar virtuoso Misha Mansoor will take to the main stage on September 29 – and he’ll be joined on the same day by The Cream Experience. 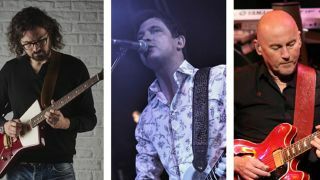 The trio consists of Guitarist editor Jamie Dickson ex Guitarist and current Guitar Techniques editor Neville Marten and former Guitarist and now That Pedal Show’s Mick Taylor. They’ll play a 75-minute set combining Cream and Jimi Hendrix classics on the main stage at 7pm – with an extra ticket required to watch them in action. In addition to the main stage entertainment and the Tuition Clinic and Acoustic Workshops, The UK Guitar Show will also feature the Gear Hall where you’ll be able to try out and buy the latest guitars, a Guitar Garage where experts will give your instruments some TLC and the Vintage Zone, featuring rarities from top collectors, retailers and much, much more. Tickets for the two-day event are now available.